To keep Christmas shopping within your budget, it helps to make a list. This guide is about creating a Christmas list. 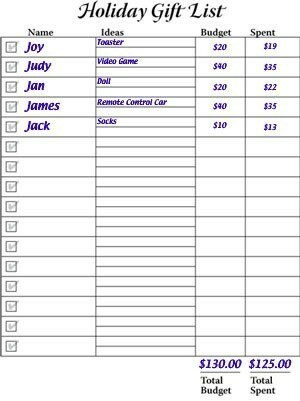 Here is the Christmas List Budget Worksheet I like to work off. 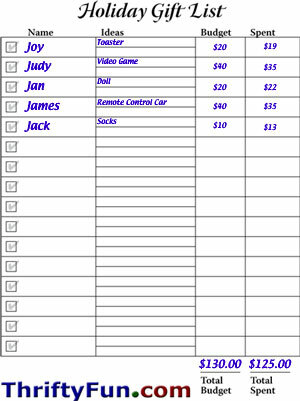 I list the names of everyone I need to get gifts for, gift ideas and how much I am able to spend on gifts. Then, once I purchase a gift, I put a check next to the person's name and note what I paid for it. Once I have finished my shopping I can compare how much I spent with how much I had budgeted. You can download this Christmas list and print it out, it's in PDF format. It is December 29th, and that means I am starting my planning for next Christmas and birthdays. It's almost a new year, and I can try new ideas! I have a notebook that I keep just for Christmas. Tomorrow is the day I write down my 2007 Christmas list. I just put the names of my loved ones. I fill in the gifts as I get them/make them. I try to think of things people can really use. For 2006, I knitted bath mitts, made scented soap, and made bath salts. The thrift store provided designer baskets for around $1.00 each, and I stuck the baskets in a blue dry cleaning bag and tied it at the top with a really nice (recycled) bow. The containers for the bath salts also came from the thrift store. Some were shaped like Christmas trees, and some were like old-fashioned wire bale canning jars. I wrapped the soap in a double layer of bright tissue. Then I used some Easter grass to pad the inside of the basket and tucked everything in as neatly as possible and tied it up with a bow. Gifts for 10 adults came to a total of about $20.00, or $2.00 per basket. So far this year, I'm making Christmas wreath ornaments out of a jigsaw puzzle. It cost .50 at the thrift store and has two pieces missing, but that won't matter a bit. I got the fun out of putting it together. Now I'll spray paint it gold. Then I can take it apart and glue the pieces in a wreath shape. We went to the craft store and bought the supplies: one can of bright gold spray paint, one bottle of some pink glitter glue, and one bottle of white acrylic paint. The pink is to make little "holly berries on the wreath, and the white is to make little dots on the holly berries for a highlight. I have some ribbon that will look nice as a bow at the top, and some string I saved from feed sacks to make hanging strings. I spent $10.00, but I'll get to use the leftover supplies on other projects, too. These ornaments will be for my friends. Now I just have family to plan for. For the rest of the year, I'll keep my eyes open for nice bargains. For example, Office Depot put out a coupon for a free ten-pack of CD/DVD ROMs, one per customer. I printed a coupon for me and one for my hubby. Haven't decided if those will be for us to use (we already have a pretty good supply) or to sell at my yard sale next spring, or to give as a gift. Lots of stores offer full purchase-price rebates on different goods, and those are good to take advantage of.